China's former security chief Zhou Yongkang has been charged with bribery, abuse of power and the intentional disclosure of state secrets, state media report. Mr Zhou was, until his retirement in 2012, one of China's most powerful men. He headed the Ministry of Public Security and was a member of China's top decision-making body. Once Xi Jinping took over as president in 2013, however, he was put under investigation. A formal probe was announced in July 2014, after months of rumours, and he has since been expelled from the Communist Party. Mr Zhou's case had been sent to a court in Tianjin, a northern port city, Xinhua news agency reported. The head of China's top court said last month he would have an "open trial", though no date has been announced. In a brief statement, China's top prosecution body said that the allegations against Mr Zhou were "extraordinarily severe". "The defendant Zhou Yongkang... took advantage of his posts to seek gains for others and illegally took huge property and assets from others, abused his power, causing huge losses to public property and the interests of the state and the people," it said. Anyone who finds themselves formally indicted with a criminal offence in China knows the likely outcome. But Zhou Yongkang will know better than anyone. He once ran the country's domestic security apparatus, with his power stretching into the court system, the police and the intelligence services. He will eventually be found guilty, of course. But we should hesitate before swallowing too readily the claim by the Chinese authorities that the downfall of so senior a figure proves the effectiveness of the anti-corruption campaign. The real question to ask is this: given that so many other senior Communist Party figures, past and present, have used their positions to enrich themselves and their families, why him? The answer must surely be that there is no good reason, other than a political one. Zhou Yongkang may well have been hugely corrupt, but he will be tried by the same opaque, pliable model of Communist Party justice that he himself did much to strengthen and perfect. The former security tsar, who is in his 70s, is the most senior official to be targeted in decades. 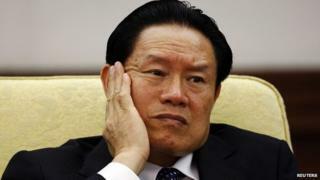 He was previously one of nine members of China's highest organ, the Politburo Standing Committee. It has since shrunk to seven members. But Mr Zhou has not been seen in public since late 2013, when rumours of a probe first emerged. A number of his former associates from his time both in the oil industry and as Communist Party chief in Sichuan province are already being investigated or prosecuted as part of Mr Xi's corruption crackdown. His former protege, former Chongqing Communist Party chief and high-flyer Bo Xilai, is currently in prison on charges linked to his wife's murder of a UK businessman. Analysts say the investigation into Mr Zhou allows Xi Jinping - who took office as president in March 2013 - to consolidate his power base, remove people opposed to his reforms and improve the image of the Communist Party.